The GMF2 is the newest fixed blade design from Vox/Ansø and this first batch is special as it is our first "Save the Children" Fixed Blade batch. Ansø and Vox drew inspiration for the design of the GMF2 and leather sheath from the style of knives they grew up using in Denmark. A modern take on an old Nordic work blade. 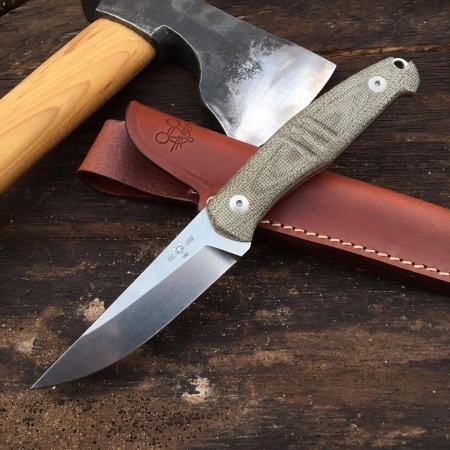 With its perfectly contoured micarta handle, this fixed blade design is comfortable in the hand, and hardy in the field. Whether you are shaving wood for a campfire or cutting rope for a hammock, the GMF2 will not let you down. Each GMF2 comes with a handmade leather sheath designed by Ansø and Vox specifically for this knife. As you may already be aware, GiantMouse donates $10 from the sale of every folding knife to the Save the Children organization. Well, our fixed blades were feeling a bit left out, and wanted to also help make a difference in the world. So, to make them happy (they are very sharp and pointy after all) we’ve come up with a special logo, as might be colored in by a child, to commemorate the first “Save the Children” fixed blade run. GiantMouse will donate $20 from the sale of every GMF2 and GMF2-P to the Save the Children organization. Each knife is individually numbered. Production unlimited at this time. Blade Steel: Bohler N690 Cobalt high performance steel. Fine stonewashed finish.